We three kings of Azeroth are. Heroes of the Storm has never shied away from trying new things. At Blizzcon this year, two game-changing new characters were revealed: Varian Wrynn and Ragnaros. Varian, king of Stormwind and leader of the Alliance, has been out for a while now. Now that he's received his customary post-launch patch, it's time to get to know him. A plain and simple trait. Every 18 seconds, Varian’s next attack deals bonus damage. The cooldown is decreased by two seconds every time Varian attacks, meaning constant aggression will get this ability to activate regularly. That’s the core theme of Varian in Heroes of the Storm: keep on fighting until you or the enemy have gone down, and don’t back off. Varian’s not too good at clearing minion waves (keep this in mind on maps like Braxis Holdout or Tomb of the Spider Queen, where clearing waves is important). His only clearing ability is Lion’s Fang, which launches a projectile forwards, dealing little damage but slowing enemies. Prioritise using it to keep up with fleeing enemies or land a little poke in lane. Doing exactly what you imagine it might, Parry causes Varian to become immune to all attacks for 1.25 seconds. He is not, however, immune to spells, and this is primarily a way to get the upper hand against attack-heavy opponents like Illidan, Tracer, and so on. Similar to Parry, Charge does exactly what you think it might do. Varian charges at an enemy, dealing a tiny amount of damage but slowing the enemy by 75% for a second. This is Varian’s way to get on top of an opponent: learning when to use this is paramount to being successful with him. He’s very good at getting into a fight, but bad at getting out of one. Learn when to go in, because Charge is a one way ticket. This is where Varian breaks the mould. Instead of two heroic abilities, Varian has three, each of which drastically changes how you play him. Taunt makes Varian a tank, greatly increasing his max health by 50% and giving him the ability to taunt an enemy, forcing them to attack Varian for 1.5 seconds. This can be used to distract opponents, keep them occupied, or drag them out of position by taunting and then running away. With this ultimate, he becomes a healthy frontliner. Colossus Smash, on the other hand, decreases Varian’s max health by 10%, making up for that with a whopping 75% attack damage buff. It also gives him a new way to engage an enemy—by leaping onto them, dealing heavy damage and increasing the damage they take for 3 seconds. It’s a good way to burst down an opponent, and works well when your team focuses on deleting enemies instantly. Twins Blades of Fury, finally, doesn’t have an active component, but has a huge impact on Varian’s regular attacks. His attack speed is increased by 100%, and attack damage decreased by 25%. His passive, Heroic Strike, also has its cooldown decreased by 9 seconds with every attack, essentially making every third attack do huge damage. Which heroic choice you should go for depends on a few factors, but it’s best to know his talents first. Level 1: Some of Varian’s talents synergise far better than others, and your start will often dictate the later talents. The two top choices at level 1 are Lion’s Maw and High King’s Quest: the former helps Varian to stick to enemies, and gives him some better poke, typically synergising best with talent choices that make Varian a wall rather than a damage dealer. High King’s Quest, then, is best for the latter, and especially synergises with Twin Blades of Fury, making up for the attack damage decrease in that heroic. Note: Varian’s talents that buff his W are strong, but go against his core playstyle, which is unyielding aggression. Therefore, the build that focuses on taking these talents isn’t worth it. Level 4: Varian wants to get on the enemy and stay there, until he or they fall. Level 4 has two talents that decide on how he wants to try and win that fight. Shield Wall is great if he wants to soak up enemy abilities and win fights by being able to take more damage, while Warbringer gives him the edge by allowing him to get in early hits as well as offering some mobility with a decreased cooldown on Charge. The latter is typically the best choice, as the stun makes Charge a good way to pick off enemies out of position, but Shield Wall is a good choice if you’re up against a lot of spells. Level 7: Ordinarily, Varian has no way to keep his health topped up. That’s where two of his level 7 talents come in. The default choice should be Second Wind: it works well with the constant aggression Varian puts out, and is even better with Twin Blades of Fury. Victory Rush is sometimes used on smaller maps, like Tomb of the Spider Queen where you’ll be soaking multiple lanes of experience. Live by the Sword is only typically viable if you’ve been taking talents for Parry since level 1. Level 10: Here’s the kicker, the key level. You should have an idea for what talent you’ll pick here from the draft phase (partly so your team knows what to draft around), but here’s the key questions to ask. Do you need a tank? If so, Taunt. Are you able to duel opponents one-on-one? If so, Twin Blades of Fury. Are you looking to burst down opponents? Colossus Smash is your friend. At high level play, Taunt and Colossus Smash are more reliable. It’s hard to get fights that don’t involve the entire team, and both of these options are better when engaging enemies who’ve picked a bad spot to stand in. Level 13: It’s hard to recommend any talent at level 13 over Banner of Ironforge. 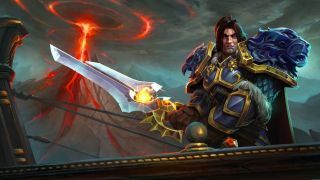 Varian’s aggressive, and isn’t made to back out of a fight: Banner of Ironforge is a good way to mitigate damage for both him and his team. Banner of Dalaran is useful alongside a team of spellcasters or alongside Colossus Smash, but Banner of Ironforge will get you out of energy scrapes to make it a worthwhile choice every time. Level 16: At level 16, Varian gets to specialise in something to counter his enemies. Against lots of enemies with a high health pool? Pick up Juggernaut. Having enemies heal a lot of your damage up? Mortal Strike’s the ticker. Against shield-toting enemies like Tassadar? Take Shattering Throw. A fun interaction: Shattering Throw counters Johanna’s level 20 talent Indestructible very well. If none of those apply, Juggernaut is the safest pick. Level 20: For his final talent, Varian’s best off upgrading his heroic ability most of the time. Sometimes, though, it’s good to switch it up: Glory to the Alliance makes abilities like Tranquility or Ray of Heaven heal for absurd amounts, and Demoralizing Shout is a good pickup if you’re finding yourself on the front lines surrounded by enemies. Varian fits into a similar niche to Sonya: get in a fight and don’t leave. There’s no easy way out for Varian apart from killing his enemies. That means the way to truly master him is to know his limits while maintaining perfect situational awareness. Whether you’re engaging with Charge or Colossus Smash, you need to pick the perfect moment. Can you team follow up? Do you have a strength or numbers advantage? Is the enemy low on health or mana? Varian’s also heavily reliant on talents: it’s important for him to pick them up simply because he’s weak at a base level, and becomes much stronger with them. It’s not uncommon for Varian’s team to lose out early on—just stay focused until you’ve picked up some levels. Never forget: choose your fights wisely. Just because you can Charge and Colossus Smash a nearby enemy doesn’t mean you should. Exercise restraint, and use Varian’s unrelenting offense in combat to pick out the perfect fights. And, if you do go down in battle, make sure it’s for the good of the Alliance.